Peace must come in many places in the world. Indeed, our hope is for peace in all the world. Rev. Stephen Sizer, who advocates for issues of peace in Israel & Palestine has shared this letter from a prominent Christian in Palestine - calling for U.S. President Barack Obama to help reshape peace in Palestine. President Obama will be visiting Israel and Palestine in March 2013. I call on you to write to Obama and tell him that if he is coming to engage Israelis and Palestinians in talks that will lead to a just peace, he is then welcome. Otherwise tell Obama to stay home. Leaders to war, followers to peace. I know very little about the Iranian cartoonist who created this image. The image has captured my thoughts. 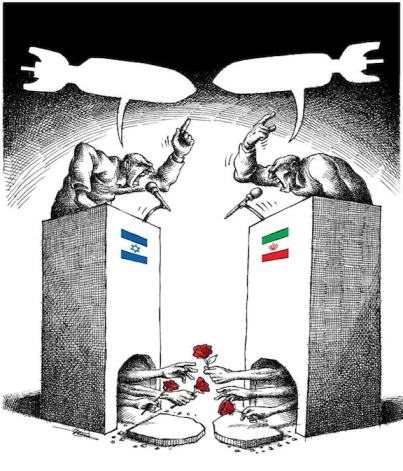 As presented by the cartoonist, the flags represent Israel and Iran. I post the cartoon here, though, not as a political commentary on either nation. I think we could place the flag of many separate nations on the podiums and the cartoon would still work! That fact intrigues me. The speakers at each podium are images of each other - truly undifferentiated. They are the same person - despite the flag on their podium - lambasting the same words, though no words appear in their respective speech-balloons! Their words do not matter - only the "shape" of their speech is important - "bombs" of impending destruction. We can not see the face of those who exchange flowers - only that they reach out, hidden from view - trying to reach the other. Their hands do not reach, though - the podiums are too far apart to allow for their exchange, despite their attempt. I wonder if the title shouldn't be different, though. "Leaders rhetoric of destruction, citizens blossoming exchange" is one of many titles I considered. The image is not perfect - and the title - including my own - is not precise. And yet, the image evokes my reflection - and I hope our reflection. What if we took the time to consider the bombastic rhetoric of war mirrored in a few leaders as the minor voice that is challenged by the gift-exchanging hopes of the many citizens? What if the voices of the many hoping for peace would proclaim softly, but decisively, their words of peace - enough to drown out the few who call for violence? Valentine's Day is for Peacemakers! It's too bad we've trivialized "Valentine" to baby-faced-winged-cherubs of myth - when a factual human of history is at the heart of today's historical core. The real historic person, the Saint - of St. Valentine's day - lived as a peacemaker, embodying love for others demonstrated in allegiance with his Christian piety & care. The Saint lived to embody relational, reciprocal love between humans that stood in opposition to warfare, violence, enemies, empires or allegiance to nationalistic overlords. "Not much is known about St. Valentine. He lived in the third century, was a priest in Rome, and was martyred in the final years of the Emperor Claudius II’s reign. Stories about Valentine have him ministering in various ways to persecuted Christians. But the story that best expresses what the saint stands for has it that he secretly married dozens of young Christian couples during a time when Claudius had forbidden male youths from marrying because he wanted them as unencumbered soldiers for his legions. Valentine was discovered officiating at one such wedding and was hauled in chains before Claudius. Once there, he tried to convert the emperor. Enraged at the priest’s presumption, Claudius had him beaten nearly to death and then beheaded." Today - let's celebrate a Peacemaker who valued love for others. 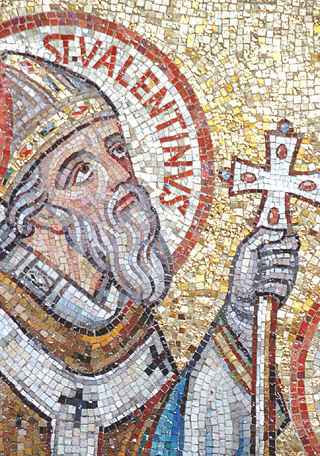 St. Valentine was willing to die for his commitment to love as testimony to how he understood God's love for the world. The Eupan Global Initiative is not a theological community. And yet, many who participate bring religious perspectives to the work of extending the good for the all. I, Marty Michelson, certainly embrace Biblical and Justice and Jesus and Peacemaking perspectives in my shared advocacy toward eupan! Religious identity shapes social and political perspectives. I comment on this as I share an article that presents an interview with Megan Phelps-Roper - a family member of Fred Phelps and his particular vision/version of belief embodied in the sadly famous, Westboro Baptist Church. I hope we can all come to better understanding - working to influence good.